Walthamstow CLP is justly proud of its marching banner, which we paraded for the full march last Saturday, with more than 30 local members. 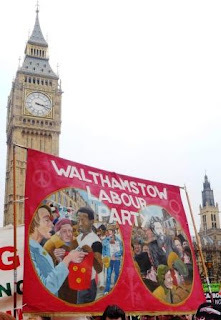 The banner was created in 1984, at the height of the Miners strike (depicted in the left hand panel), and the centenary of William Morris founding the Socialist League in 1884 (the right hand panel), by artist Dave Bangs [who conveniently included his phone number on it if anyone wants to catch up with him!] Amongst the thousands of machine made banners displayed on the March there was nothing to match its hand-painted individuality, and it drew constant interest and admiration. You can see my facebook pictures here.